There's little doubt Sony's monstrous 84-inch 4k TV will be a high resolution atom bomb of a TV. There's also no doubt it costs $25,000, about as much as an actual atom bomb. 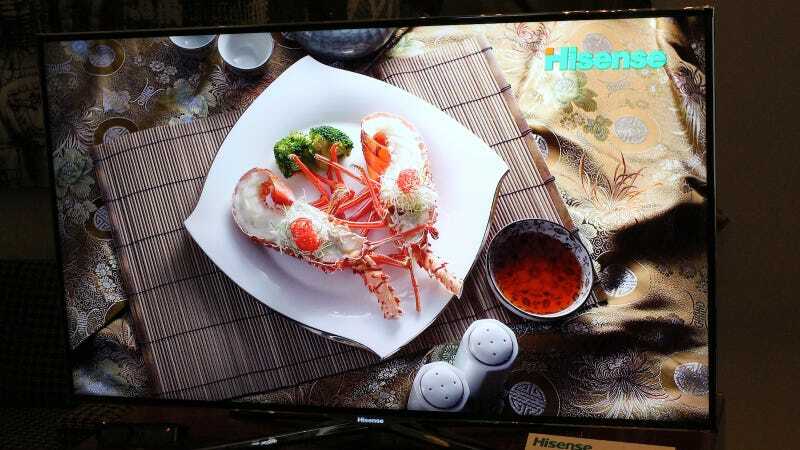 Hisense is selling a 4k unit for under $6,000. Do the math. Major, major caveat: Hisense's XT880 is 50 inches, whereas Sony's 4k offering is 84. Thirty four inches is a lot of inches, and could account for the price disparity—and maybe preclude as huge a rift between Hisense's as-of-yet-not-priced 65-inch 4k set and Sony's closest equivalent. Second major caveat: 4k might not make sense at 50 inches. If you're sitting far enough away, odds are you probably can't notice the pixels in your 1080p television. But for those in smaller spaces, where the screen door effect pops up, Hisense will give you a (relatively) cheap way to never, ever notice pixels again, thanks to the fact that the company manufactures its own panel straight outta China, cutting out middle men. And indeed, smushing my face right up against the panel yielded not a single discernable pixel. There was some flicker at certain angles, and what looked like compression artifacts along image edges, but that could just as well be attributed to the source material. We'll see more from Hisense at CES, but in the mean time, don't panic: there might actually be a way for you to afford the next great leap in HDTV.